The whole thing has made us do things differently. It’s given us a different slant, a different purpose to get the bus. Opened our eyes to see the world differently. While Bud is on a bus I am sat at my desk preparing for the next ‘Still Lively’ Consortium meeting. 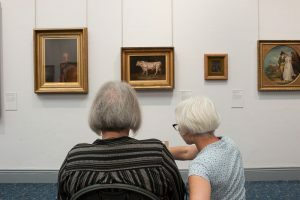 Wolverhampton Art Gallery, Choices Housing Association, Staffordshire Arts Services, and Creative Health CIC, are working together to deliver Still Lively, our Celebrating Age project. Each partner has identified one or more of their venues to become a Still Lively hub. 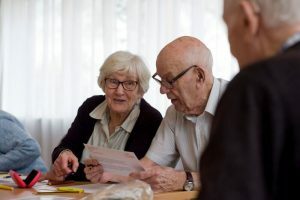 These hubs provide opportunities for older people to work with visual artists and writers to create, share and celebrate their creativity. Work created is being toured across venues to inspire older audiences. I have been engrossed reading the stories we have been collecting from everyone involved in this programme. It takes me away from the four walls of the flat and gives me something to look forward to. I get lost in the art activities and it helps me mend, giving my mind a break for a little while. Many of the stories talk about gaining a sense of purpose, of rediscovering the joy of the arts, and being proud of their achievements. Getting through the door is the hardest. Coming here is the motivation to do something I’ve always wanted to do; I needed to go somewhere to do it. People have talked about how important it is to use the Gallery: that’s what they’re for and it’s what will keep them open. Bud, one of our regular participants, told us that ‘the whole thing has made us do things differently’. Still Lively has also given the team of artists opportunity to do things in a slightly different way. Jim Morris, one artist, talked about how he approached meeting staff and tenants at each ShireLiving scheme for the first time. I don’t normally draw at meetings but there was going to be a lot of saying hallo and sharing information so I thought, as this is about drawing and making, I will draw. I did and it actually turned out to be a good way in. We don’t teach, we set out to inspire, support and encourage yet people have learned to draw, in their own way, in a way which makes sense to them and to ‘make marks with meaning’. I am always mindful that everyone should succeed so I minimise the chances of anyone feeling that they can fail. At the right time Tom positively pushes people outside their comfort zone and allows them to struggle. It’s at this point that people are creating very interesting work and surprising themselves. I wanted to learn to paint, but now I don’t care if it looks like it should. I tried and I’m really proud. Collecting stories have been an excellent way of reflecting on our work, sharing it with other members of the Still Lively Consortium and reminding us all that ‘everyone’s journey is different’. Still Lively is funded through Celebrating Age, a joint Arts Council England and Baring Foundation Fund.